The above is an example of reporting by Fox news. 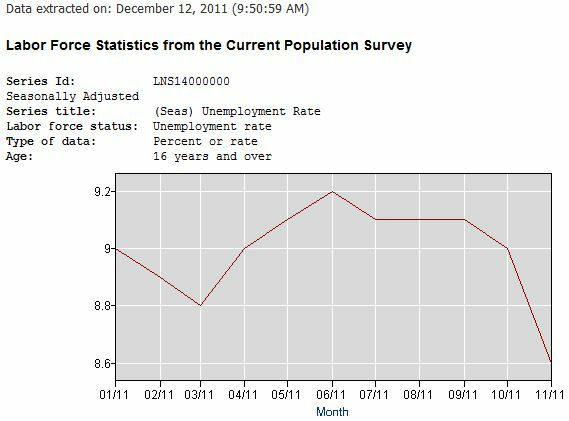 Notice anything about the graph? The location of the trend line for the most recent number of 8.6 for November is higher than the placement of the line when the number was 8.8 back in March. Media matters first pointed this out. 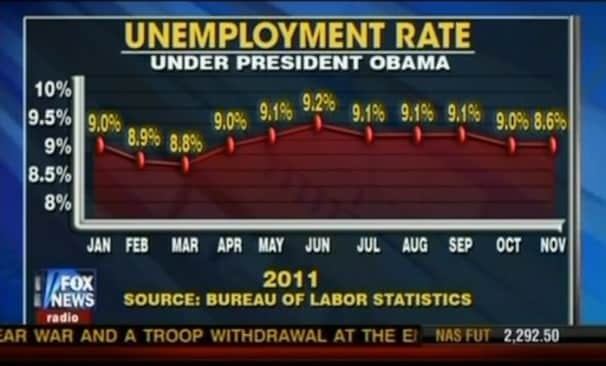 According to them when the unemployment rate dropped to 8.6 Fox news rounded up to 9.0! Maybe the chart below (also from media matters) gives a more accurate picture? I don’t think so but it does make the point. The claim that it is easy to manipulate impressions with “misleading” graphs is easy enough to defend and requires no additional elaboration. Notice anything about the above picture? Seems like they got Romney wrong. It remains quite impressive how Fox news can continue to manipulate images and political inclinations. The Republican debate sponsored by Fox had very little to do with the press’s noble goals of providing fora for issues. The audience was loud and highly partisan and many questions were designed to highlight Republican platform positions and attack Obama rather than clarify issues. Rush Limbaugh and the conservative talk radio crowd have been using these techniques for some time. These issues are a little beyond the “peace and conflict” subject matter of this blog, but they do speak to the issues of the press and its role in a political environment. Democratic values as they apply to the press are important. Issues such as accuracy, independence, freedom from bias, and integrity are important. The news media should always make the distinction between factual news stories and opinion pieces. Fox’s manipulation is to blur this distinction. When conservative talk hosts are attacked for their partisanship the Fox leadership claims that they’re not supposed to be news but entertainment. There certainly is a place for intelligent opinion and perspective which are often essential to understanding the consequences of the story. But we can see from the above examples that Fox is a little sloppy when it comes to representing accuracy and authority. A recent study of Reuters proprietary websites examine their reporting related to the Middle East conflict. The study ran tests of articles for problems with logical fallacies, propaganda, and violations of Reuters handbook. These were tested in order to determine attitude shifts and support for belligerent parties in the Middle East conflict. The results indicated that there were over 1,000 occurrences of reporting and ethical failures that attitudes did shift as a result of being exposed to these reporting and ethical transgressions. For example, atrocity propaganda or lies and manipulations about the extent of violence and atrocities increased favorability and sympathy toward Palestinians. The same was true for the use of pity and subordination propaganda. The authors of the study concluded that Reuters engaged in systematically biased storytelling in favor of the Palestinians, and these biases directly influenced audience affect and behavior. On the one hand, these findings are not surprising but they certainly demonstrate that errors, biases, and manipulated frames do have strong effects. Both Fox News and Reuters must work on improving clarity and accuracy. A diverse employment environment is one response to these biases. This includes more than simply gender and ethnic differences but must include differences in terms of knowledge and perspectives. Fox with respect to national political news and Reuters with respect to international news must do better at accuracy, error correction, focusing on intelligent and coherent perspectives rather than bias, information quality, and balance. Fox will continue to maintain its distinction between traditional news and editorial or opinion and defend their use of the media designed to direct perspectives in a certain manner. They have found a business model that allows them to maintain a conservative ideology and still garner enough of an audience. Although there is nothing particularly wrong with representing a coherent political ideology, there is something very wrong with rank partisanship and mistakes. Posted on December 18, 2011, in Media and politics and tagged bias, Media, News. Bookmark the permalink. Comments Off on The Quality of Fox News Reporting. Benjamin Netanyahu ‘the Magician’ Is Re-Elected Israel’s Prime Minister—but at What Price? He’s nice, he’s experienced and he’s younger than Ringo. The Supreme Court seems poised to let the administration manipulate the 2020 census by adding a citizenship question to it. She recounts her evolution to feminist in her new memoir. The kingdom this week executed 37 “terrorists” after torture and sham trials. Corporations and governments should demand an end to the kingdom’s egregious violations of human rights. Sarah Huckabee Sanders, nominally the White House press secretary, has abandoned the custom of briefing the news media.